Outlander Homepage: “Holding On To Faith” - a recap of Season 2 episode 7 by your Aussie blogging lass! “Holding On To Faith” - a recap of Season 2 episode 7 by your Aussie blogging lass! OutlanderHomepage Originals, By Susie Brown. There is a change to the music this week, with the Skye Boat melody taking on almost a carousel feel. This is accompanied by a faint spinning effect of the camera, as the viewers’ eyes adjust to the fact that the images being shown are not from the 18th century, but decidedly more modern. Indeed, the title soon flashes up: Boston 1954. A red headed girl is looking at a library book on birds and calls her mother over to show her one of them. 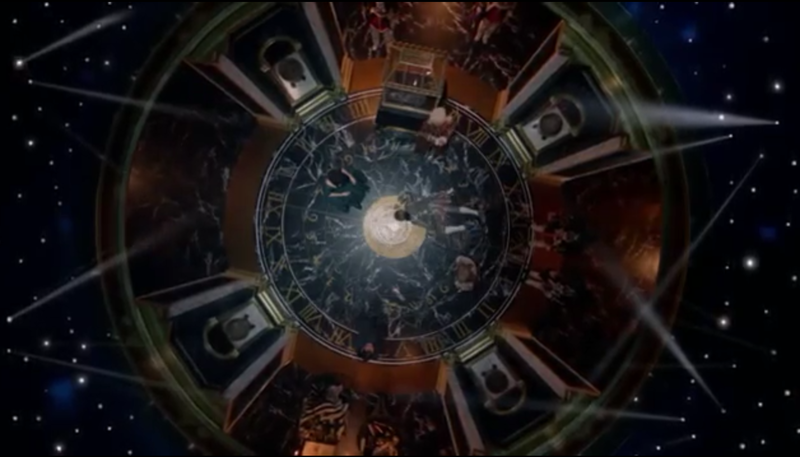 The mother is Claire and we realise that we are back in the 20th century, a few years after Claire’s return. Book readers already know exactly who the little girl is, while tv only viewers can safely assume that this is the child that Claire agreed to raise with Frank. Mother and daughter look at the book, with the child asking what bird it is. Claire tells her daughter that it is a heron, adding that she had seen one in Scotland. 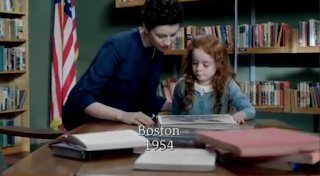 A wistful look crosses her face, as the young girl asks when her mother was in Scotland. Having promised TV Frank in episode 1 to leave the past behind, Claire says only that it was a long time ago. As the scene ends, the book image morphs into a close-up of an actual heron, leading us back to the 1700s and the continuation of the drama from the previous episode. Claire is lying on a bed in the hospital, fractured images all around her. Her view is blurred and out of focus, images and noises surrounding her. Mother Hildegarde is trying to calm her; one of the sisters is praying and Monsieur Forez, in an ironic reversal of his previous conversation with Claire, is trying to save lives - both hers and her child’s. Claire’s distressed voice breaks above the noise, alternating cries of “my baby” with “Jamie.” She is white and vulnerable, as Mother Hildegarde tells her to stay calm. A single tear rolls down her cheek as she seems to focus on the flying heron and the camera pans out to reveal the dire nature of the situation to the viewers. There is little doubt that Claire’s baby has not survived. Claire’s eyes are wide and pleading and she is unable to comprehend what she is being told. She becomes increasingly distressed, saying that it is not possible and demanding over and over that her baby be brought to her. As she struggles to rise from the bed, the statue of the virgin Mary, which one of the sisters had suggested could comfort her in her grief, due to the fact she too had lost a child, shatters onto the tiled floor. The despair heightens in the scene that follows. Several days have passed and a calmer Claire is feverish, her breathing ragged. She asks Mother Hildegarde where her baby is now and the older woman tells her that she had baptised the girl, naming her Faith. It is an illegal thing to have done, as babies must be living in order to be baptised, but Mother Hildegarde explains that she wanted Claire’s daughter to be buried in hallowed ground. It is an action that she says will stay between the two women and God. A priest arrives to perform an unction of the sick, in order to “prepare the soul” as Mother Hildegarde says. It is now that we realise that the older woman expects Claire to die as well, and is doing everything she can to care for Claire’s soul, if she cannot heal her body. Claire says that she needs her husband, but Mother Hildegarde replies that there has been no word of Jamie. When the father asks if Claire would like to make a last confession and unburden herself of any sins, Claire says that her sins are “all she has left.” It is a comment that highlights how utterly alone and defeated Claire feels. The priest begins his prayers, as Claire begins to shiver - the fever is taking hold. Mother Hildegarde orders Bouton to stay with Claire and the dog curls up obediently at the foot of the bed. who warns her that he will be finished if anyone finds him there. 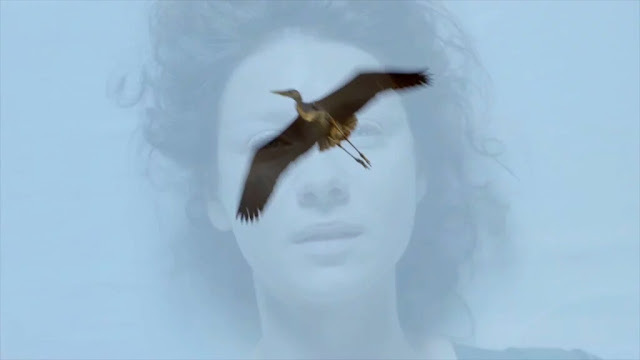 He asks Claire what she sees and the vision of the heron returns, as Claire answers that she can see blue wings. When Claire replies that she has no child, Raymond says that he did not call her that because she was with child, rather that it is the colour of the aura that surrounds her like a cloud. It is a healing colour, the colour of the virgin’s cloak and the same colour as his own. Claire tells him that he shouldn’t have come and that he has placed himself in danger. Raymond confirms that she had been right: that the King wants blood and that he must leave. When Claire asks if she will ever see him again, Raymond tells her to have faith. They will meet again. Calling Bouton back to his position at Claire’s feet, Raymond slips away just in time. The nuns arrive and proclaim Claire’s recovery a miracle. As the sister runs in search of some broth, Claire asks Mother Hildegarde again about Jamie. Mother Hildegarde explains the situation: Jamie is unable to come. He has been arrested and is being detained in the Bastille at the King’s pleasure, although the penalty would have been much worse if Jamie had killed his opponent. Mother Hildegarde continues to explain that Randall’s injuries were great, but he has survived and has been given leave to recover in England. In one respect, this is good news. Randall has gone from their lives again and if Black Jack lives, then so does Frank. But anger has now overtaken Claire’s thoughts. She tells Mother Hildegarde that her husband had betrayed her, with his need for revenge more important than her or their child, breaking the promise he had made to her to grant “one year of grace”. When Mother Hildegarde responds with a verse from bible, in which it is desirable to “throw iniquities into the sea”, Claire replies that she doubts that there is a sea big enough. Tears fill her eyes once more, but they are tears of anger now, not despair. but not her soul. Fergus had come to the hospital, her voiceover explains, bringing flowers and asking when she will return. Having lost both husband and child and faced with nowhere else to go, Claire agrees and Fergus, in Jamie’s place, takes his frail mistress’ hands and helps her out of the carriage. This is perhaps the most beautiful and heartbreaking scene to date. The servants all rush to line up outside the house, standing in silent respect and sorrow as she appears. 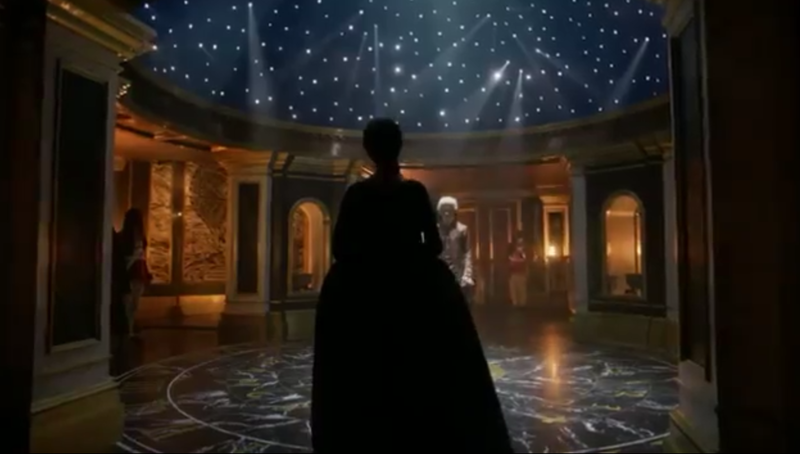 With a beautiful melody composed by Bear McCreary, a melody which his blog identifies as the Faith theme, Claire walks slowly down the line, while the servants bow and curtsey in unison. When she reaches Suzette, the housemaid tearfully kisses Claire’s hand and Claire begins to lose her composure. When she reaches Magnus, he whispers “Welcome home, milady” and begins to bow. But Claire stops him, putting a hand on his chest and then taking his hand. Tears falling now, she whispers back, “Thank you, Magnus” and curtseys to him instead, as the butler closes his eyes, overcome with emotion. 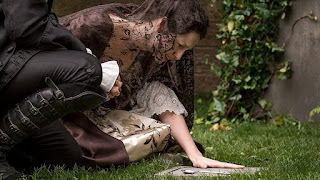 It is a stunningly simple and totally heartfelt piece of acting from both Caitriona Balfe and Robbie McIntosh - and it is well nigh impossible to watch it without crying. 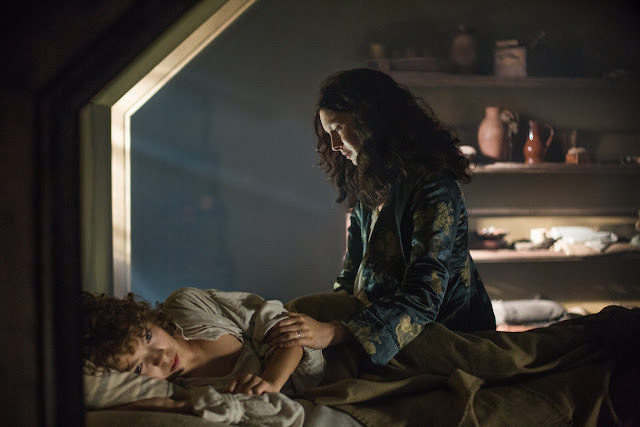 Later that night, Fergus is brushing Claire’s hair for her. When she has had enough, she dismisses him, but not without noticing the young boy freeze at the sight of the perfume bottles on her dresser. He in turn dismisses her questioning “What is it?” by saying that it is nothing and leaves the room. Alone again, an emotional Claire is pacing the room. Her eyes catch the box of apostle spoons and she lifts the lid, picking up one briefly, before her emotions start to get the better of her. Closing the lid, she picks up the box and kicks it under the bed, before grabbing her wrap and leaving the room. In the hallway, her own grief is interrupted by the sound of Fergus’ cries. She goes into his room and finds him calling out in his sleep. She wakes him, telling the young boy that he is just having a bad dream and that he should tell her about it, as it might make him feel better. But Fergus soon explains that it isn’t just a dream. 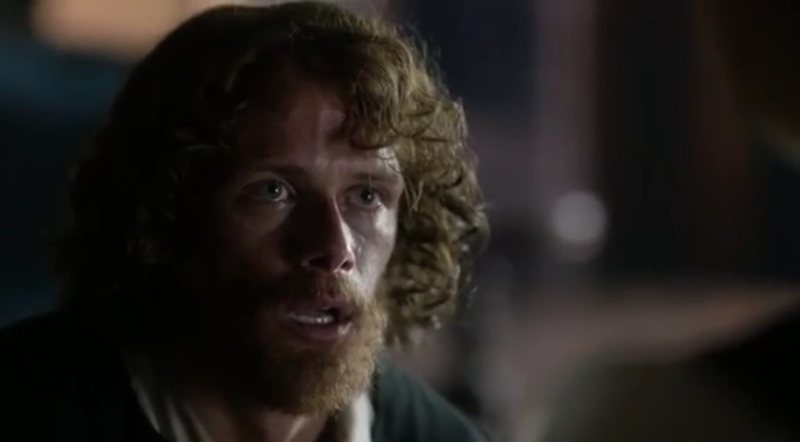 This is yet another stunning piece of acting, this time from Romann Berrux, as Fergus. 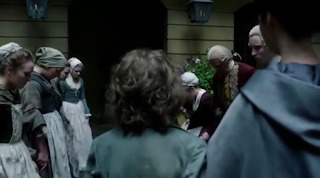 Haltingly, Fergus begins to tell Claire what happened to him when he accompanied Jamie to Maison Elise. 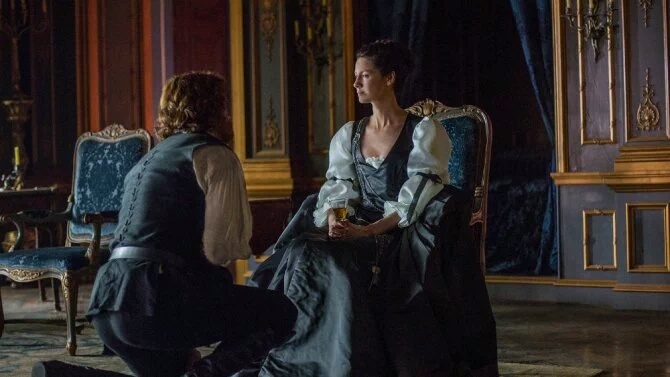 After disobeying Jamie’s order to stay put, Fergus had gone into an open bedroom after spying a bottle of perfume that he had decided to steal for Claire as a gift. He breaks off his story to hand Claire the bottle in question, remarking that it is lavender. Claire looks at the perfume as it it were poison. Lavender is the scent favoured by none other than Black Jack Randall. 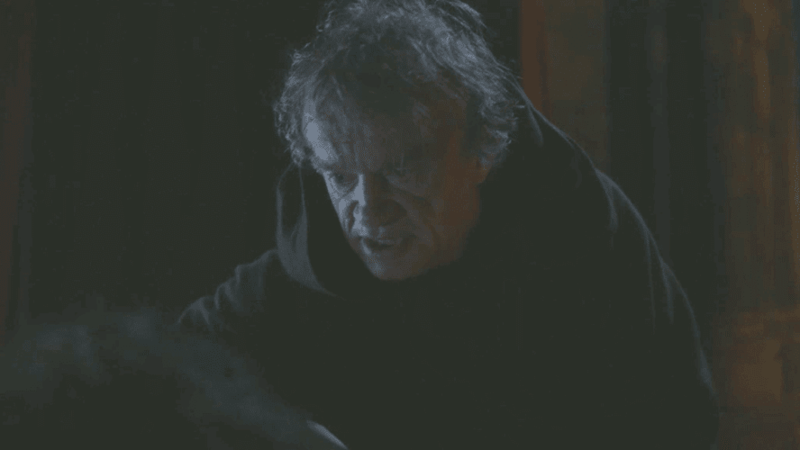 He had used it during the attack on Jamie and Claire herself had used it when trying to ransom Jamie’s soul. In a chilling flashback, we see Black Jack discover Fergus in the room. Remarking that Fergus is not what he ordered, but will do, Randall grabs Fergus and begins a sickening assault. Claire listens in horror as an increasingly distraught Fergus finishes his tale, blaming himself for what has happened. 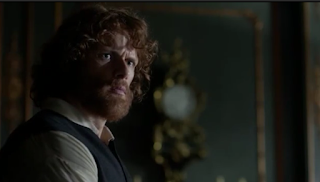 On discovering Fergus being assaulted, Jamie had attacked Randall, breaking his promise to Claire on the spot and demanding a duel. Claire draws Fergus to her, saying over and over that it is not his fault. In this moment, she is a mother, comforting a distressed child and the moment is all the more poignant for this realisation. A more composed Claire goes to see Mother Hildegarde in the next scene, asking for the older woman’s assistance in obtaining an audience with the King. As Mother Hildegarde was goddaughter to the old sun King, Claire reasons that she will have the connections to make an approach. When Mother Hildegarde remarks that Claire must have found a deep enough sea, Claire replies that she now knows the reason why Jamie broke his promise to her and that while she is still angry at him, she wants to petition the King for Jamie’s release. Mother Hildegarde remarks that there will be a price to pay - as a “mercurial man”, Louis will undoubtedly expect Claire to lie with him. Undeterred, and with a bitter edge to her voice, Claire remarks that if it comes to sacrificing her virtue, she will add it to list of things she has already lost in Paris. Arrangements are made and Claire takes another carriage ride, this time to the palace. Walking down the ornate hallway, Claire is pale, but determined. She wears Master Raymond’s pendant, her hair is styled and her dress immaculate. She is shown into the King’s quarters and comes face to face with Louis, who resembles a rather immaculately dressed spider, attempting to charm the latest addition to his web, remarking that he does not bite. Louis offers Claire hot chocolate from New Spain and an orange from one of his own trees. 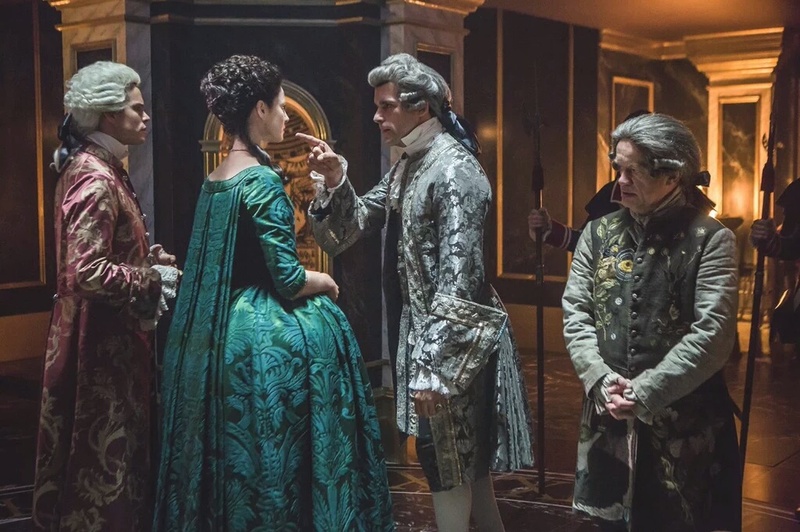 Under Louis’ intent gaze, Claire begins to make her plea, explaining that Jamie is in the Bastille and that while she agrees that he has broken a royal decree, it was only because he had been provoked and that as a Scot he is most fierce when questions of honour are concerned. She breaks off Louis’ response with a meaningful glance saying that she would be most grateful. Louis notices both wedding bands, remarking of Claire’s noteworthy loyalty to two husbands and slowly kisses both rings. Louis states that he is inclined towards mercy. Claire waits to see what the King’s pleasure will be, her voiceover remarking that as an absolute ruler he may do whatever he likes with both Jamie and herself. Louis says that if he grants Jamie’s release, he would like Claire to do a small favour in return, to which Claire repeats that she is at his complete disposal, a reply which pleases the King greatly. Claire looks towards the bed chamber, expecting to be led there, an assumption emphasised when Louis holds out his hand, saying “Come.” He caresses her face, commenting on her fine, pale skin and remarks that he can see why she is called La Dame Blanche. Claire barely has time to register her surprise that Louis has used this term, when she is swept away from the bed chamber and led into another room, guarded by masked men. 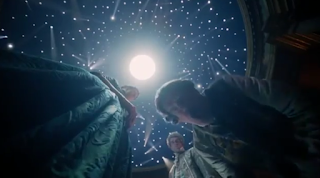 An elaborate canopy of stars is above her head, fires burn in vessels around the room and Monsieur Forez emerges from the shadows. Louis asks for Claire’s assistance and two men are brought into the room. They are two men that Claire knows well: Master Raymond and Comte St Germain. Both have been charged with sorcery and the perversion of knowledge into an exploration of arcane arts, in order to use the dark arts for their own agendas. 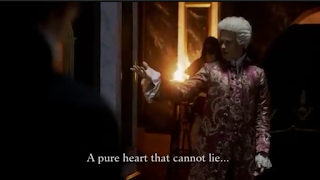 Monsieur Forez presents evidence which has been gathered from Master Raymond’s apothecary and the Comte’s residence. Introducing Claire as La Dame Blanche, with a heart so pure that she cannot lie, Louis says that Claire is able to look into men’s souls and see if evil dwells there. Muttering her trademark “JHRC” under her breath, Claire realises what she must do: tell Louis whether or not darkness exists in the men’s souls. If so, Louis says, they will be handed over to Monsieur Forez and executed. Claire has no option but to agree. Walking to Master Raymond first, Claire smiles briefly at him. She moves to the Comte and begins a performance, stating that she sees a shadow behind the Comte’s eyes and begins to describe a gang of masked men called Les Disciples and asks him what he knows. But instead of confessing to being behind Claire’s attack, an increasingly angry and fearful Comte says he knows nothing of Les Disciples. He calls Claire a witch, stating that she has been known to drink poison and survive. When asked by Louis how he knows this, the Comte admits that he gave it to her, in retribution for her destroying his business. With a cool stare and smile, Claire agrees that yes, she is a witch, but a white one, practising white magic. 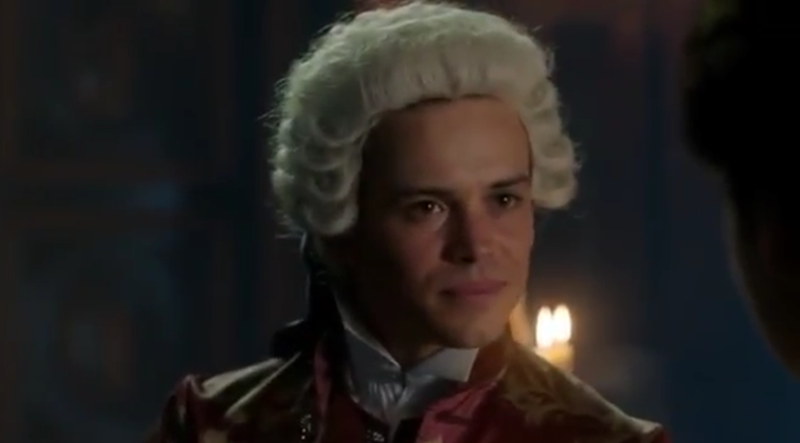 Louis reminds the Comte that Claire is not the one on trial. Despite knowing that St Germain had indeed intended to poison her and would have succeeded if it had not been for Master Raymond’s penchant for substituting bitter cascara for poison when customers asked for it, Claire is still reluctant to condemn him to death outright. She paces the room, saying that she sees darkness in Raymond’s soul too, but only the normal darkness that exists in every man, indicating that both Monsieur Forez and the king himself fall into this definition, adding that without darkness, there can be no light. It is the Claire of old returning briefly for a minute - confident and in command of a situation. Like the heron, she is standing on her own once again. Louis remarks that he must make an example, if he is going to cleanse the city and suggests a way to aid Claire’s decision. A serpent is dramatically produced, startling Raymond, the Comte and Claire alike. Louis says that the bible states that a snake will not harm a true believer of God, clearly expecting the men to handle the deadly creature. Looking around, Claire suggests another option: that she give the men the same poison that the Comte had given her, asking that if they drink it and survive, Louis will free them. Louis allows her to give the poison to the men, but makes no promises as to their ultimate freedom. telling Claire that he will see her in hell. Within moments, his face darkens and he collapses. 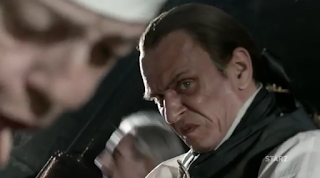 Stepping over the Comte’s body, Louis turns to Raymond, saying that the man should count himself fortunate and commanding the older man to leave Paris immediately. As Raymond is led away, his eyes on Claire in a silent goodbye, Claire’s voiceover recalls a line from the Wizard of Oz when Dorothy farewells the Scarecrow, remarking that she will miss him most of all. Claire asks Louis if he will honour her original request. All charm gone, Louis now remarks that first there is the matter of the payment. 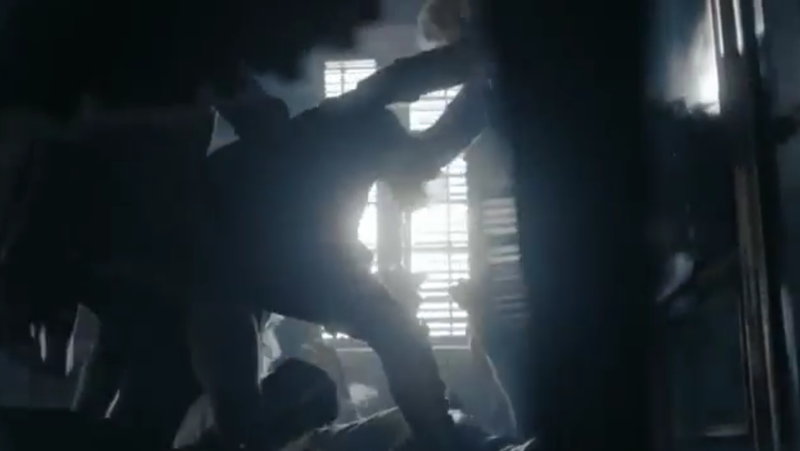 He pulls her roughly from the room back into the bed chamber, where Claire is pushed back onto the rich bed cover. Louis takes his payment with a handful of short thrusts, while Claire lies back and thinks of England. 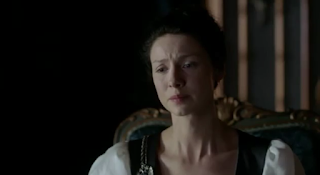 It only takes seconds and Claire opens her eyes, realising in some surprise that it is already over. She sits up and straightens her skirts, to see Louis already rebuttoning his trousers. He tells her that he will issue a pardon for Jamie and also arrange one with the English crown, so that they may return to Scotland. With an impatient wave of his hand towards the door, she is dismissed. In a piece of beautiful comic precision, Claire picks up the orange she was offered earlier and curtseys. She is escorted back down the hallway, stopping briefly to gaze back in disbelief at what has occurred. The camera pans back as she walks slowly from the palace. The slow walk is mirrored as the next scene begins, but this time it is Jamie, walking slowly up the staircase of the Fraser house. He pauses midway, uncertain, before continuing, head bowed. Claire waits at the top of the stairs, but does not look at him. This scene is perhaps one of the most anticipated for book fans. The stakes were high, as it was expected that Caitriona Balfe and Sam Heughan would do a stellar job of the emotional conversation that Claire and Jamie were about to have. As they have done time and time again throughout this season and the last, the two actors did not disappoint. This was heart wrenching stuff and not watched by many without a box of tissues - and perhaps a whisky- close to hand. Jamie is in shadow as the scene begins, our focus on Claire’s face. She is emotional, tears welling up, but her lips are pressed tight and her eyes are angry. Jamie is pleading, his voice husky with equal emotion, saying that he doesn’t know if the baby was a boy or a girl. She refuses to answer and he whispers her name, asking if she will make him beg. She turns and walks away from him, as he comes into full view. We realise that significant time has passed. 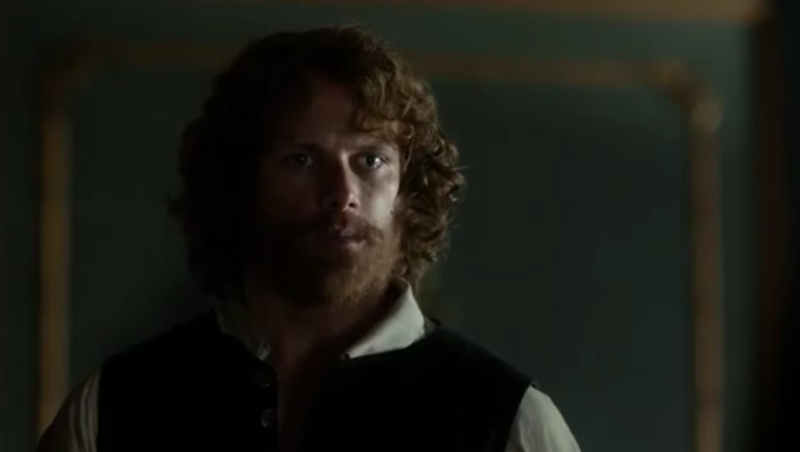 Jamie’s hair is scraggly, his face covered in a full beard. He is wearing the same clothes from the duel - he has obviously come straight from the Bastille. Claire sits before she answers, telling Jamie that the baby was a girl and that Mother Hildegarde, with an odd sense of humour had named her Faith and buried her in the cemetery next to the convent. Jamie comes closer to her, telling her urgently that he did try to keep his promise. We are now taken in flashback to the point where the statue of the virgin Mary shattered in the hospital. Mother Hildegarde brings Faith to Claire, so that she can see and hold her. In an exquisite display of a mother’s ultimate grief and ultimate love combined, Claire marvels at the beauty of her dead daughter. Back in the present, Claire is holding her emotions tightly in check, speaking in a voice thick with pain. She describes Claire to Jamie, who watches mesmerised, pain crossing his own face as he hears of the transparency of Faith’s skin, like a pearl still wet from the sea. He bows his head when Claire tells him that Faith’s eyes were a bit like his own and that she had wisps of copper hair. We then see Claire singing to her daughter, a song popular in 20th century vaudeville, about liking to be beside the seaside. It is usually sung joyfully, but here it is full of longing, a longing that we see on three faces - first Claire’s in the hospital and then Jamie and Claire back in the present. Still they have not touched, or really looked at each other. The desolation is palpable. Louise de Rohan appears in the final flashback scene of the episode and observes Claire still enamoured of her daughter. Louise asks how long Claire has been like this and Mother Hildegarde answers that it has been since the morning. With a brief touch of her own pregnant belly, Louise tentatively approaches Claire. It is a beautiful tender scene and kudos goes to Claire Sermonne, for showing this side of Louise. No longer the pouty socialite giggling at trivial matters, Louise is tearful and full of concern. She answers Claire’s question, “She’s beautiful, isn’t she”, with an honest “She’s an angel” and asks if she may hold the baby, adding that it is time. Grief stricken all over again, Claire nods, kissing her daughter in farewell and finally handing her over to her friend. 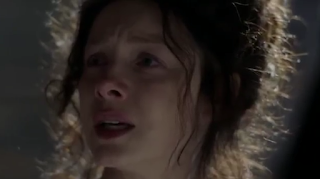 At this point, Claire’s resolve crumbles totally and she falls sobbing onto the bed. Jamie whispers “Aye” and turns away, sitting down across the room. He is as desolate as she. But Claire hasn’t finished. She has come full circle now, blaming herself for what has happened. She was the one who asked the impossible of Jamie, she was the one who put Frank before their family, she was the one who followed Jamie to the woods. Jamie is quick to contradict her, saying that Frank is her family too. “But he’s not here,” replies Claire. “And now neither is our daughter.” She continues to self blame, adding that it’s not Jamie’s fault, or even Randall’s. It’s hers. Now it is Jamie’s turn to offer comfort. As the Jamie and Claire theme begins slowly in the background, he moves towards her. He says that he had asked her forgiveness once, to be told that there was nothing to forgive. Similarly, he says, he has long forgiven her for anything she could ever do. Claire takes this as her cue for her final admission: she slept with the King to buy his freedom. Unnerved, but determined, Jamie replied that she did it to save his life, in the same way that he had given himself to Randall to save hers. His eyes are full of tears now and she too is struggling to hold herself together. She asks Jamie how they can ever be the same and he replies that they cannot. The weight of what has happened is too much for either of them to bear alone. Jamie kneels before Claire saying that the only way they can live with it is to carry it together. His voice catches on this word, and Claire asks through her tears if he is sure that he wants to do that. Still, despite their grief and renewed commitment to each other, they have not touched. The final scene opens on a gravestone saying “Faith Fraser.” Jamie kneels before it, holding the apostle spoon of St Andrew, the patron saint of Scotland. Faith’s music begins again as Jamie speaks directly to his daughter. He kisses the spoon and lays it on the grave, telling Faith that if they have to bury her in France, they will leave a piece of Scotland with her. 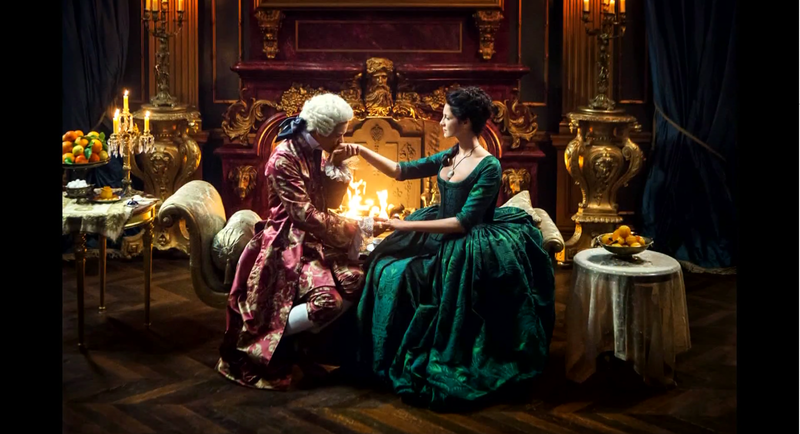 Claire kneels beside him and they each cross themselves. 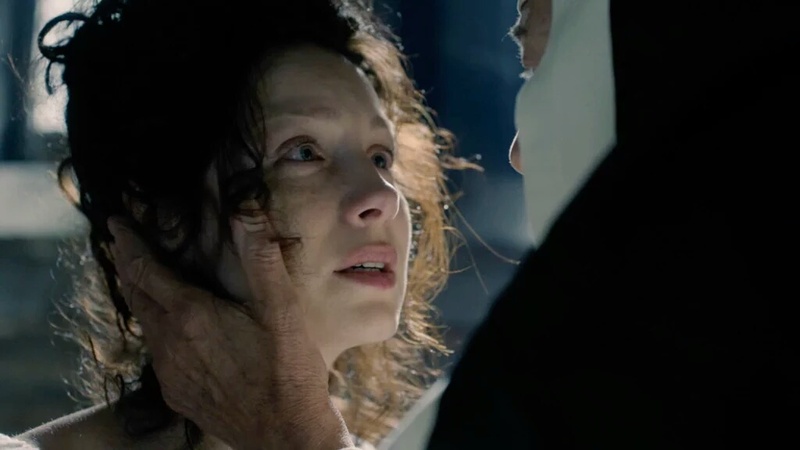 Finally, Claire’s hand reaches for Jamie’s and he grasps it tightly, as they bid farewell to their daughter. This was a tour-de-force episode. Clearly the highlight of the season so far, it is hard to imagine that it will go unnoticed at awards time. Caitriona Balfe is breathtaking, but each actor brings their utmost to this important part of the story. While many relationships fail after such a tragedy as losing a child, it is precisely because Jamie and Claire choose to carry the burden together that they can survive. The essence of Jamie and Claire’s love is highlighted in this episode and we hope against hope that some healing and happiness will come to them in Scotland. As viewers, we feel privileged to be part of this journey, undertaken as it has been with such obvious love and respect. This recap was written by Susie Brown, a teacher-librarian and children’s writer who lives in Australia. She hated Jamie’s beard when she first saw it, but is now able to concentrate on the acting and marvel at the talents of the actors. This was perhaps one of the most heart wrenching episode of any tv series that I have ever watched. If anyone watches this, you must have a box of tissues to hand. All of the actors in this episode and specifically Caitriona Balfe absolutely must receive high praise for this episode from TPTB. If not? Then you have the highest praise from every fan out there who has watched from the beginning. Thank you for the beautifully written recap of this episode, Susie Brown. It was written very thoughtfully and exactly as I saw it. I know that this episode will tear at the very fabric of the souls of those who have lost a child by miscarriage, still births or for me the 7 years of not being able to conceive. Know that at the end of the darkest tunnel, there will be light. Keep the faith and remember Faith will get you through it. I believe that children live on after death, in your hearts, most of all but also in the arms of Mary's lost child, Jesus, as well. I believe that this episode is all about Faith in the middle of such terrible circumstances. Jamie and Claire will get thru this too as they have because their faith and love for each other is so strong. We can only hope that they will find their way back to each other again in Scotland. We know that the little red-headed child at the beginning of the episode is a major clue. On a personal note. I finally had my baby girl after 7 years of heartbreak. All I needed was a little hope and Faith.